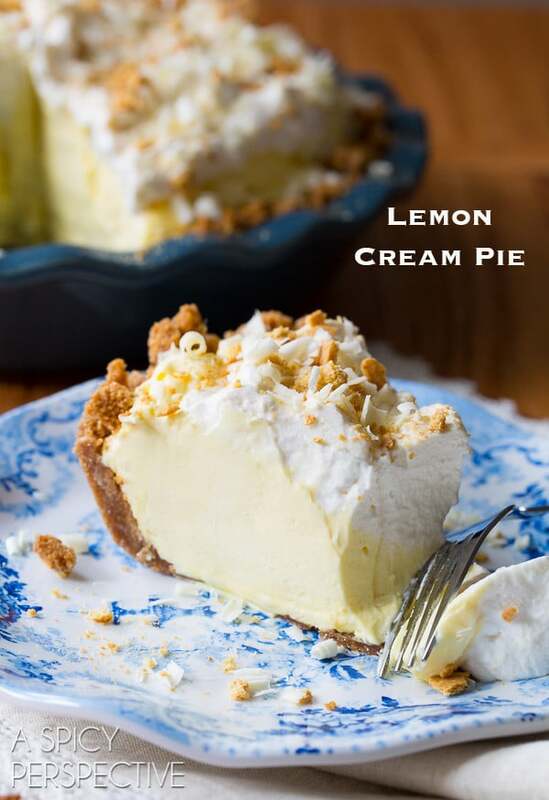 I’ve got a light fluffy Lemon Cream Pie Recipe for you today! A lemon pie that is perfect for spring parties and can be made in a hurry. As I was making and photographing this pie the other day, I had a deja vu moment and snickered to myself. Then I went to check the recipe catalogue here on ASP to see just how many cream pie recipes I’ve shared with you already. Four. That makes today’s lemon pie the fifth cream pie recipe I’ve shared… and I haven’t even started on my chocolate variations. 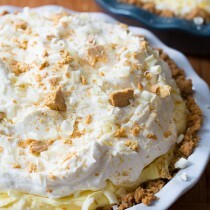 Once you see images of this gloriously smooth Lemon Cream Pie Recipe, I doubt explanations are required. 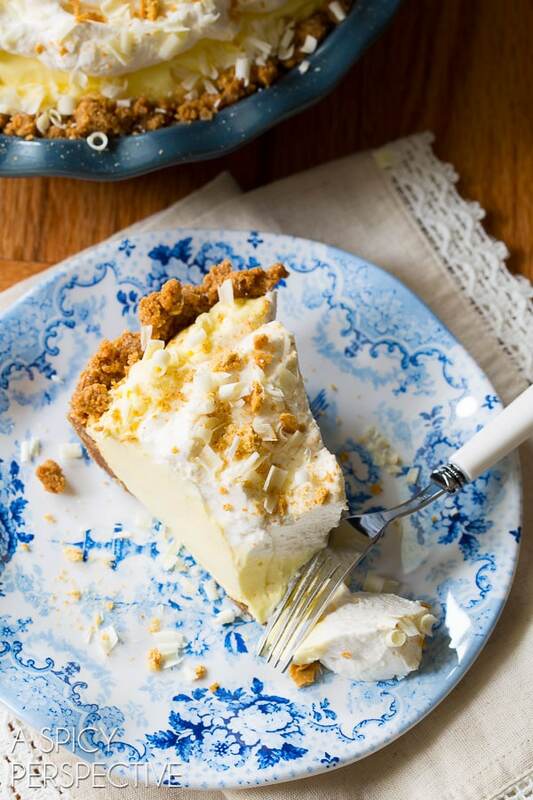 It’s light and creamy in texture, with a tangy-sweet lemon flavor that pairs perfectly with crumbly homemade graham cracker crust. 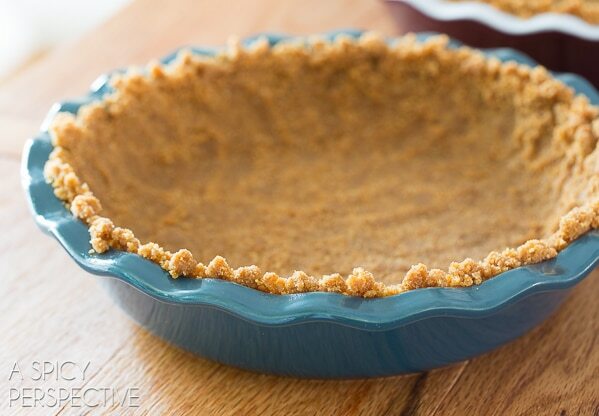 Plus, other than baking the graham cracker crust for a few minutes, there is no cooking required. 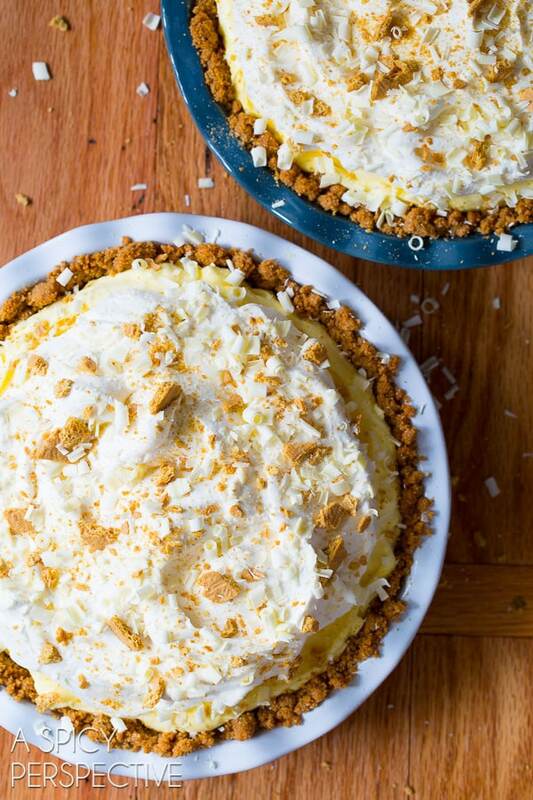 You simply beat the lemon cream pie filling ingredients together, then scoop it into the crust. 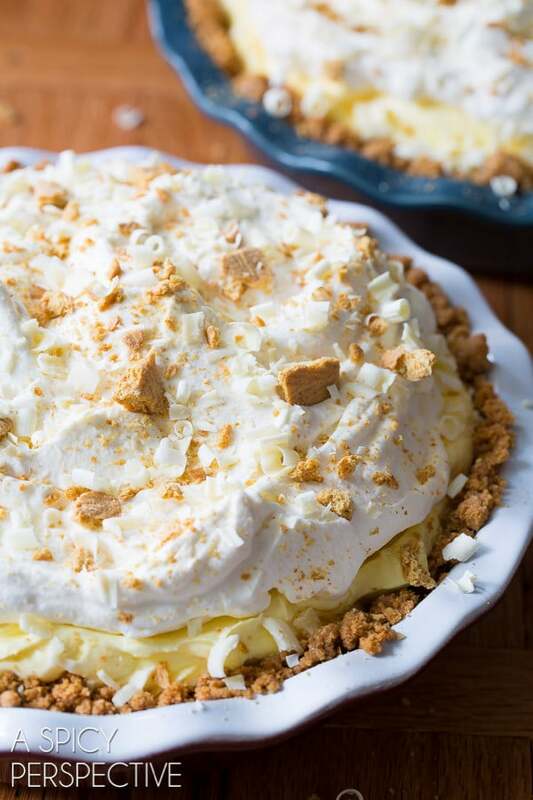 Top the Lemon Cream Pie Recipe with fresh whipped cream, and sprinkle with white chocolate shavings and crushed graham cracker. 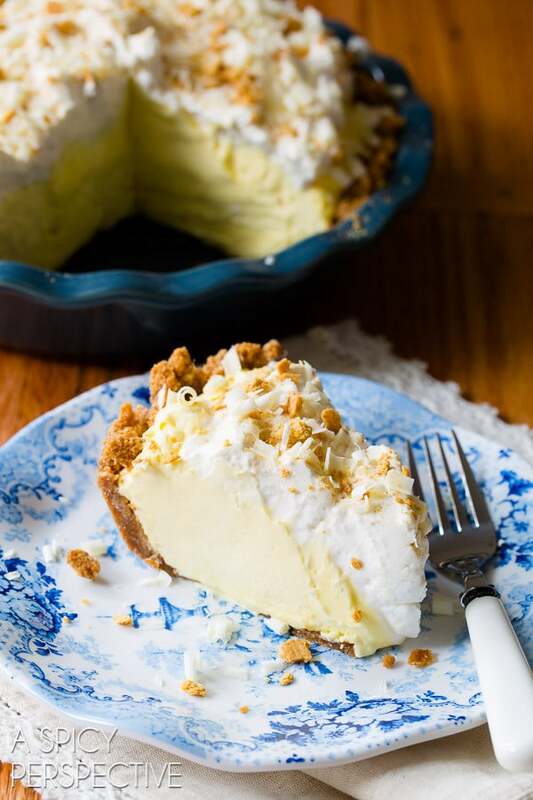 This Lemon Cream Pie Recipe with Homemade Graham Cracker Crust is so light and airy it lifts your spirits and lightens your mood. 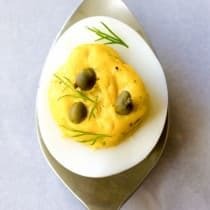 And I’ll be serving this Lemon Cream Pie on gorgeous shatter-resistant dishes from Q Squared NYC. Q Squared offers elegant dishes for less than high-end china, yet with just as much style! (Like the Cambridge Collection you see here.) They are made out of resin so they are safe for little people to pass around the table. Spring is here, it’s time for picnics and pie. Of course, I suggest starting with this one! 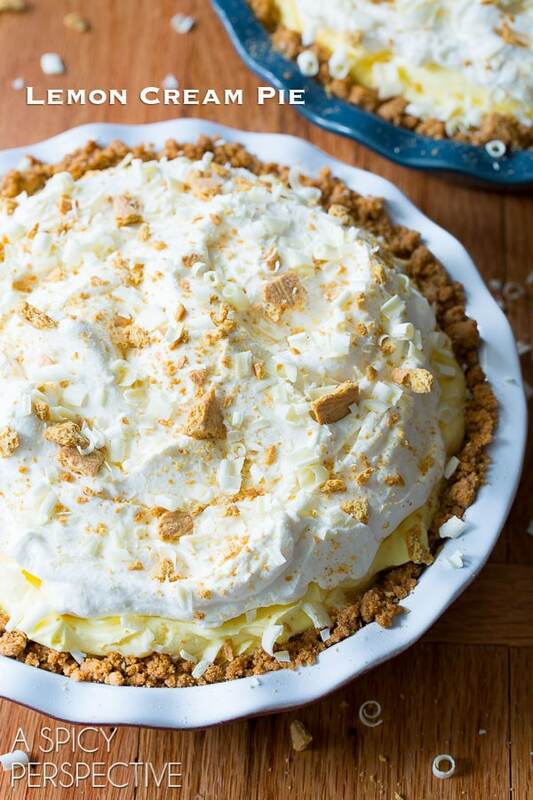 Our fluffy silky Lemon Cream Pie Recipe is hard to resist! 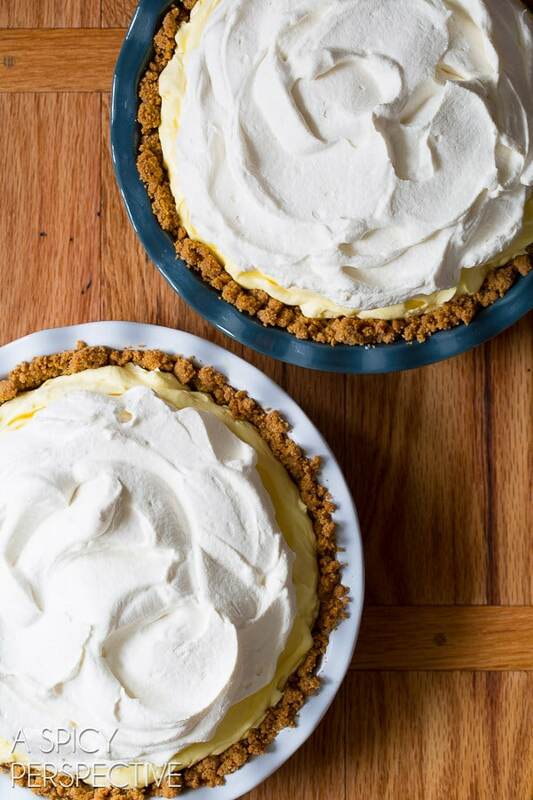 If you love lemon, but not meringue, try this lemon pie recipe. Preheat the oven to 375 degrees F. Place the graham crackers in the food processor. Pulse until the crackers are chopped to fine crumbs. Add the melted butter, sugar, salt and cinnamon, pulse to combine. Add 1 teaspoon of water and pulse a couple more times. Press the graham cracker mixture firmly against the bottom and sides of the deep pie pan. Then bake for 8-10 minutes. Cool completely. For the Lemon Cream Pie Filling: Using an electric mixer, whip the heavy cream with the 3 tablespoons of sugar and vanilla extract, until firm. Scoop into a separate bowl and chill. Then mix the instant pudding and milk in another bowl, until well combined. Using the mixer, beat the cream cheese until fluffy. Then with the mixer still running, add the pudding. Scrape the bowl and beat until completely smooth. Then slowly beat in the lemon juice. Using a spatula, fold in half the whipped cream. Scoop the lemon cream pie filling into the pie crust. Smooth the filling and top with the remaining whipped cream. 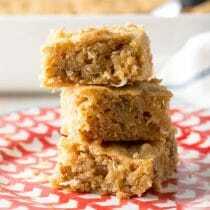 If desired sprinkle the top with crushed graham crackers and white chocolate shavings. Cover gently with plastic wrap, and chill for at least two hours. Serve cold. Disclosure: I am a product ambassador for Q Squared NYC. All opinions are my own. 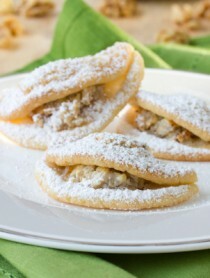 I just made this recipe and the filling was very lumpy. I followed the steps exactly, with the exact ingredients. Has anyone else encountered this problem? What might I be doing wrong? It sounds like you didn’t beat the cream cheese and pudding mixture long enough. If you try it again, just make sure that is VERY smooth before moving on. Beautiful and delicious pie! I made this for Father’s Day and my whole family enjoyed it. Next time I make it I will either add more lemon juice or add some lemon extract. The lemon flavor wasn’t very prominent to me. So if you really want that lemon flavor, add some more juice!! what size pie plate did you use….other than LARGE??? and DEEP?? 9 ? 10 ??? 12 ??? I plan to make this delicious looking pie but have a a question. My package of Jello Instant Vanilla Pudding is 102 grams, (4 servings). So I thought I would weigh out the 5.1 oz from 2 packages, to get the correct amount of filling. However there is a larger package of “Jello Vanilla Pudding and Pie filling” available in the store. Perhaps that’s what I should be using?.. or will regular instant pudding work. TIA for your help! Hi Anne! Either product will work, as long as it’s “instant.” My grocery store has is in both sizes… You might try looking somewhere else, or measure it out of two boxes, if the larger box isn’t instant pudding. Hi, this pie looks so good. I was wondering why is it vanilla pudding instead of lemon? I am not a very good cook/baker but this looks too good not to try. I’m making the first one tonight for Hubby, using sugar free Jello vanilla pudding. If I can pull it off, I’ll make a second one tomorrow night to take with us to family dinner on Easter Sunday. Thank you for a beautiful pie and easy recipe. First stumble across your blog. I made this pie and did shortcut with a premade crust just to be sure I like the filling(I’m sure I definitely will). But I garnished with lemon zest. I think it gives it a different look as well as indicates what’s in the pie. Excited to try more of your recipes! Thanks. This might be a silly question, but I was hoping you could clarify something for me. When you speak of the instant vanilla pudding, are you just talking about the mix or actually making the pudding? I have used vanilla pudding mix in choc chip cookies, for softness…but not making the pudding itself, so I just wanted to make sure I understood all of the instructions! Thanks Sommer! Hi Becca! You use the powdered instant pudding mix, but you do blend with a partial amount of liquid in the recipe below, then add it to the rest of the filling. Does that help? How far in advance could you make this pie? Hi Karis! You could make it 3-4 days in advance. Maybe even longer, but your whipped cream might start to loosen. Happy Baking! Can’t wait to try this. Lemon is my favorite flavor for summer. About the plates. Have you ever microwaved them? It says on the site not microwavable but wanted to know why? Would they shatter? Made this for last night’s party! It was a hit. 2 pieces left for us today! YUM!!!! 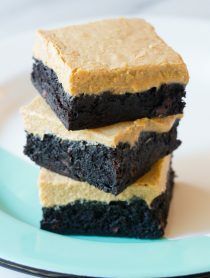 This is on my must-make-soon list and what a great idea for an Easter Sunday dessert! Love the board! Oh my goodness… I can’t wait to try this! yummy!! This pie – how divine! This would definitely be a winner at my house. Sommer, this pie looks insanely delicious! 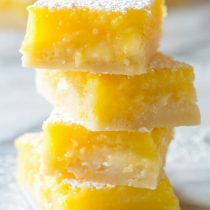 I absolutely adore lemon desserts and have been craving them like crazy lately. This pie is now officially at the top of my list. Pinning! Can’t wait to try this pie! I’m in love with these blue and white plates!! Do you have the whole collection? What a beauty!! That lemon cream is mile high!! Now that is some pie! Who could resist this! Sorry I was asking if there is a substitute I could use for the vanilla pudding? Or if the pudding can be maid from scratch? Hmmm… Not a place I’ve spent time. You could order it online. 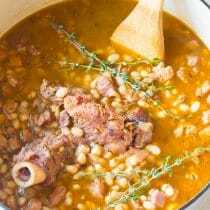 (There’s a link in the recipe.) Or you could make a thick vanilla pudding from scratch. The problem is, I used much less liquid with the pudding mix than normal to give the pie a firm base. You could try making a pudding recipe like this, but reduce the milk by half. http://www.realsimple.com/food-recipes/browse-all-recipes/vanilla-pudding The pudding will come out thick and pasty, but that’s how it needs to be for this recipe. This lemon pie looks beyond delicious! I really want this to top off a long Monday. This looks wonderful. Please hand me over a large slice! Wow spectacular pie. One knows that it is the creamiest, most lemon of pies. Love lemon pies! I’m sure this tastes creamy and delicious! OMG! What I would not give for a slice of that!! Oh this pie!! Yes please, a few slices!! This is absolutely beautiful!!!! LOVE the lemon! lovely! Looks like an Easter dessert for our menu! I don’t think I’ve ever had a lemon cream pie. Such a great, refreshing idea. 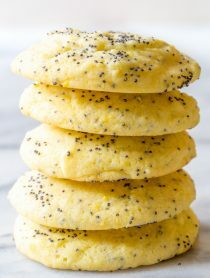 I am a total lemon addict – I would choose it over chocolate any day. This looks amazing and I can’t wait to try it!! I would like a slice….better make it two of this delicious pie! Gorgeous and just perfect for spring! Your cream pies are the best! Beautiful! Lemon ranks second to chocolate around here—and your pie looks divine!!! Beautiful Sommer!! I want a slice! I love a good lemon pie! I’m sure yours is the best!